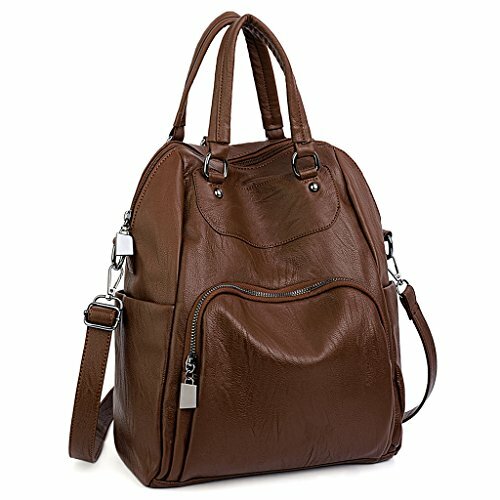 HIGH QUALITY - Ultra soft synthetic washed leather with tungsten steel color hardware. 2 adjustable/removable back straps and 2 top loop handles. 3 WAYS CONVERTIBLE PURSE - Backpack carried by 2 back straps. Using 1 back strap to make this bag into a Crossbody/Single shoulder bag. Handheld by 2 top loop handles. LARGE CAPACITY - Interior: Main zipper compartment contains 2 internal zip pocket and 3 open pockets. Exterior: 1 front zipper pocket, 2 side open pockets and 1 back zipper pocket. EXTREMELY PRACTICAL - Comfortably holds a 9.7" iPad, tablet or a laptop 10" and under. Exterior pockets can hold your smartphone, water bottle, umbrella, cosmetic, hair band, house keys and other tiny items. DIMENSIONS - 10.63"L x 5.11"W x 12.59"H. Weight: 1.96 pounds. Adjustable back straps: 40.35". Handle drop: 4.33".